Are there some people that you have no clue as to what to buy them for a holiday gift? If so, then I have an easy and delicious solution to help solve that often difficult problem. You could send them a Classic Christmas Gift Basket like the one I was sent to review from Gourmet Gift Baskets. The scrumptious assortment of award-winning snack products I received consisted of a big dark chocolate bar, cheese biscuits, raspberry honey mustard pretzel dip, dipping pretzels, peanuts, chocolate-covered cherries, gourmet chocolate-chip pecan cookies, buttered pecan crunch, trail mix, and almond pecan crunch. This selection was simply hard to pull yourself away from each yummy product. This would make a fantastic gift for any person you need to buy for whether for the home or office. Trust me, no one would be able to resist any basket from Gourmet Gift Baskets from what my family and I sampled. So if you’re in a fix and need something special to send as a gift or just for yourself, then I highly recommend sending this $59.99 particular Classic Christmas Basket from Gourmet Gift Baskets. 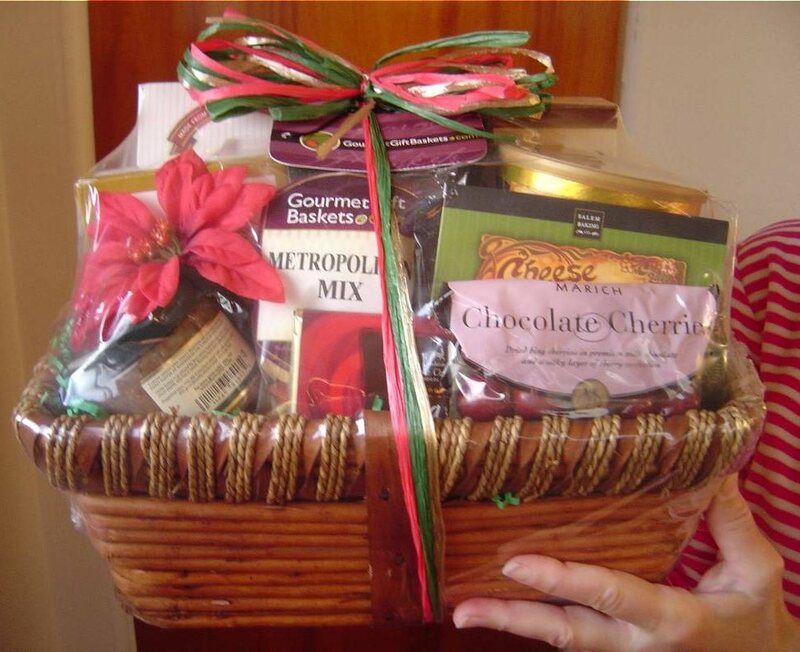 You can order Gourmet Gift Baskets online, find them on Twitter @gmtgiftbaskets and “Like” them on Facebook. But I encourage you to find them and spread some holiday cheer giving a basket.